Day 5 started with an amazing breakfast at 7:30 am. Next we went to the Carrillo field to play lacrosse with the Costa Rican national team for the second time this trip. First we practiced with them and showed them some new drills and skills to practice. After the practice we scrimmaged them so they could work on the new skills they had learned from our practice earlier in the day. And it payed off. They applied what they had learned and worked together as a team and ultimately scored a goal. Once this game was over, the girls played a game and it was Los Gatos High vs Archbishop Mitty. But the Mitty team fell a bit short on players so the girls coaches stepped in to help them play. Finally, we played a third game of everyone, girls and boys, Costa Ricans and Americans, mixed together. 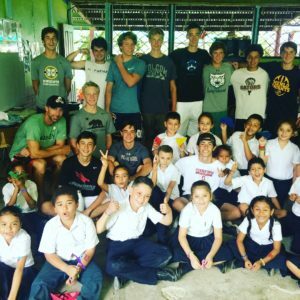 Since the girls do not have any pads, we all played girls lacrosse rules which was a new experience for the boys and the Costa Rican national team. After this game was played we all went to lunch together. When we were all done eating lunch we had some free time so we all decided to go to the beach and we met up with the girls there. Once the beach time was over we all went back to our hotels to get changed for a hike. The hike was amazing. The views were beautiful and we all got some good pictures. My favourite part of the hike was getting to see monkeys which I had not seen for the whole trip until the hike. When we finished the hike we went to dinner for Mexican food at Coco’s. It was delicious. Finally we went back to our hotel for some much needed rest after such a busy day.